BRISBANE, Australia (AP) An American man pleaded guilty and was sentenced Friday for the manslaughter of his wife, who drowned during their honeymoon scuba diving trip in Australia. Her body was found on the ocean floor. In move that outraged the victim's family, David Gabriel Watson will serve just one year of the four-and-a-half-year sentence in the death of his wife of 11 days, Christina Mae Watson. She died in 2003 as the couple dove off the tropical coast of Queensland. The suspended sentence is not unusual in such crimes in Queensland. Watson, from Birmingham, Alabama, was to stand trial in the Queensland Supreme Court for murder, which carried a potential sentence of life in prison, until the prosecution accepted the guilty plea to the lesser charge. Prosecutor Brendan Campbell told the court the manslaughter plea was accepted on the basis that the 32-year-old Watson - trained to rescue panicked divers - failed in his duty as her dive buddy by not giving her emergency oxygen. David Gabriel Watson, left, and Christina Mae Watson are seen on their engagement. Campbell said Watson allowed his wife to sink to the ocean floor without attempting to retrieve her, and he did not inflate her buoyancy vest or remove weights from her belt. "He virtually extinguished any chance of her survival," Campbell said. Outside court, Christina's father, Tommy Thomas, said his family was in disbelief over the sentence for the man who went by the name Gabe. Christina was called Tina by family and friends. "I'm sure that the entire Australian nation as well as our country back home shares in the shock at what we've just seen, because it's a total injustice ... it's ludicrous," Thomas said. "It's an embarrassment to everyone involved. We believe that Gabe Watson murdered our daughter." In an interview Friday with NBC's "Today" show from Brisbane, Thomas said the family had told Australian authorities they were "totally against" the plea deal. "We wanted Tina to get justice, and the only way we thought she would get that would be through a criminal trial with a jury," said Thomas. The victim's sister, Alanda Thomas, called the plea agreement "disgusting." "It's complete injustice all the way around," she said on "Today". Watson married Christina in a ceremony described by her friends as her dream wedding in Birmingham on Oct. 11, 2003. Eleven days later, a dive instructor found her lying on the bottom of the ocean during a weeklong Great Barrier Reef scuba diving trip off the coast of Townsville city. Watson told police her death was an accident. Coroner David Glasgow formally charged Watson with murder last June. Glasgow said it was likely Watson killed his wife by holding her underwater and turning off her air supply. The coroner said a possible motive was her modest life insurance policy. Watson turned himself in last month to answer the murder charge in the northeastern city of Brisbane. 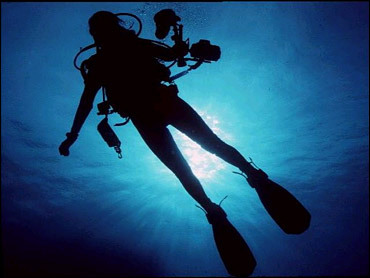 An experienced diver who has since remarried, Watson had said in videotaped police interviews that 26-year-old Christina, a novice diver, started having trouble a few minutes into their dive. He said he decided to go for help rather than attempt a rescue himself. One of the dive leaders pulled the woman to the surface, but efforts to resuscitate her failed. A fellow diver told Glasgow's inquest last year he saw Watson engaged in an underwater "bear hug" with his petite wife, after which he headed to the surface while she sank to the ocean floor. Watson told police his wife knocked his mask off and then sank too quickly for him to retrieve her. But the prosecution rejected his explanation, saying it would not have been possible for her to sink rapidly.